Woodward writes in his new book that Modi wanted to go to Camp David, the picturesque presidential resort, to dine and develop a personal bond with Trump. 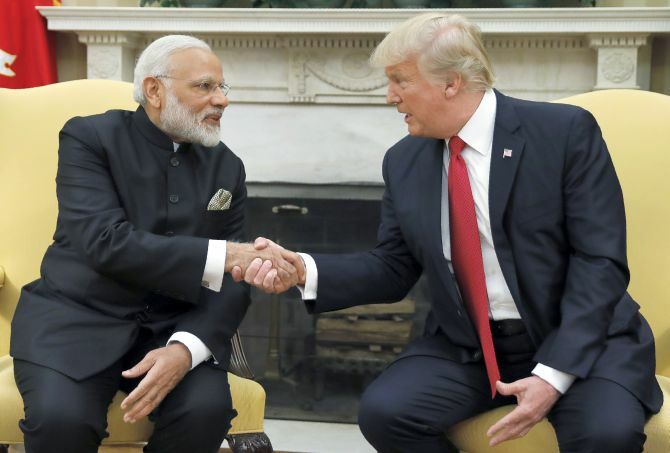 United States President Donald Trump described Prime Minister Narendra Modi as his friend who told him that the US has got nothing out of Afghanistan, according to Bob Woodward's latest book that hit stores on Tuesday. 'Prime Minister Modi of India is a friend of mine, he (Trump) said. I like him very much,' Trump is quoted as saying by renowned journalist Woodward in his book Fear: Trump in the White House which has portrayed a dysfunctional Trump administration. The White House has described the book as 'reckless' and a work of fiction with the president calling it a 'joke'. 'He (Modi) told me the US has gotten nothing out of Afghanistan. Nothing. Afghanistan has massive mineral wealth. We don't take it like others -- like China,' Trump is quoted as saying during the July 19 situation room meeting. 'The US needed to get some of Afghanistan's valuable minerals in exchange for any support. I'm not making a deal on anything until we get minerals. And the US 'must stop payments to Pakistan until they cooperate',' Trump said. 'We're losing big in Afghanistan. It's a disaster. Our allies aren't helping. Ghost soldiers -- those paid but not serving -- are ripping us off. NATO is a disaster and a waste, he said. The soldiers had told him that NATO staff were totally dysfunctional,' the book says. 'Pakistan isn't helping us. They're not really a friend,' despite the $1.3 billion a year in aid the US gave them, Trump said. Woodward also writes that Modi wanted to go to Camp David, the picturesque presidential resort, to dine and develop a personal bond with Trump. The book has a small segment on India and June 26, 2017 visit of Modi to the White House. The 448-page book claims to give an insider's account on the White House working and decision-making process in Trump's presidency. 'The prime minister of India, Narendra Modi, who had been courted assiduously by (Barack) Obama, was coming for a visit to the United States in June to see Trump. India was the counterweight to Pakistan, which was giving the new administration as much trouble as it had given previous ones by hedging maddeningly on terrorism. 'Modi wanted to go to Camp David and have dinner, bond with Trump,' Woodward writes in the book. ''It's not in the cards,' Priebus told McMaster. 'We're just going to do dinner here. It's what the president wants. ',' Woodward quotes Priebus as saying. This made McMaster angry. 'He (McMaster) understood the strategic importance of India, a sworn enemy of Pakistan. Outreach and strong relations were essential. The later event for Modi was a 'no-frills' cocktail reception. The working dinner was at the White House,' Woodward, the famed investigative journalist, writes in the book. There was no immediate comments from the Prime Minister's Office. Will US President Trump visit India?